13" scrubbing path, 61 lbs. 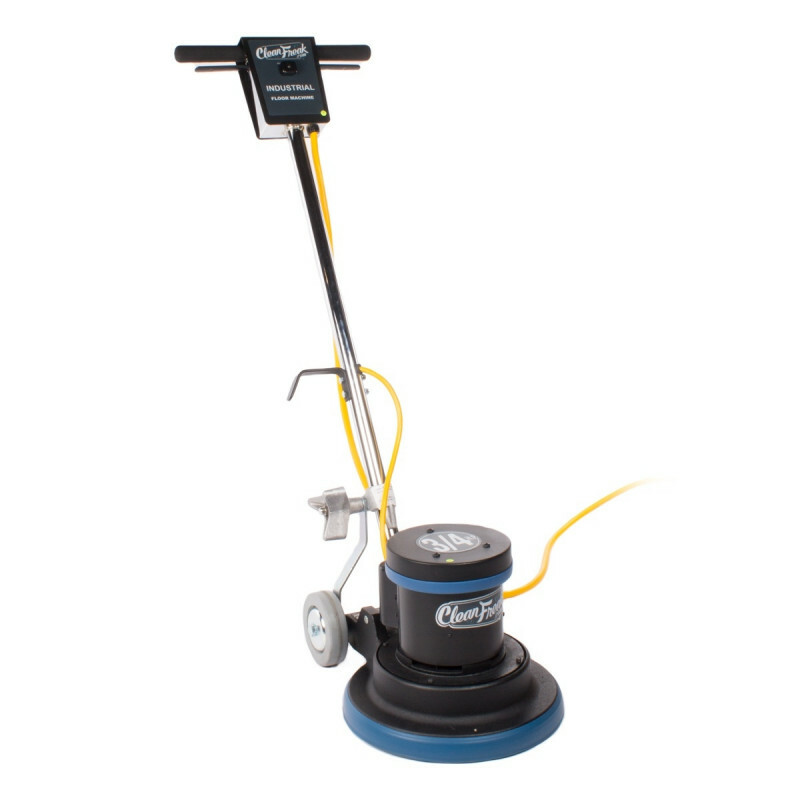 The CleanFreak 13" floor buffer is powerful enough with its 0.75 horsepower motor to scrub carpeting before doing a complete carpet extraction. Great for scrubbing small traffic areas and spotting those heavily soiled areas. It is also great for scrubbing hard to get into areas of hard floors, like those found in a bathroom. No longer do you have to carry those heavy buffers up and down stairs to do your cleaning. This little buffer weighs only 61 pounds, and does the work equal to that of a much larger machine! Comes with a 5 year warranty on the motor and 1 year on parts. Pad holder sold separately. For a larger machine, take a look at our complete line of rotary floor buffers. 13 gauge, 1¼" diameter steel chrome handle is durable enough for any job. 5 inch non-marking wheels make this carpet scrubbing buffer easy to transport. All aluminum shroud and chassis withstand the toughest, most labor intensive jobs. Triple planetary transmission provides efficient power transfer from motor to pad driver or brush. Safety switch for protection against operator error to help avoid injuries. Customers who were interested in the CleanFreak® 13 inch Carpet Scrubbing Floor Buffer were also interested in the following items. I am a commercial floor-man for over 40 years. I use this Clean Freak 13 in. floor buffer for floor stripping, power scrubbing of floors, tile and grout cleaning, and bonnet carpet cleaning. I purchased the floor buffer with all the attachments -- brushes, pads and bonnets. This machine is light weight but powerful and gets the job done! This 13 in. floor buffer handles well and performs like any other industrial floor machine. Great machine with a good price. I have a small cleaning business and use this to clean carpets. It is very easy to use, I've had it for about 4 months now and have not had any problems with it. This is a review for the CleanFreak® 13 inch Carpet Scrubbing Floor Buffer.